In the world of modern web, icons have become an indelible and integral part of UI design. From navigation menus to social media icons, symbols and indicators, icons feature heavily on almost every single website and app on the internet and its popularity showing no signs of waning anytime soon. Consequently, every developer has to face this conundrum – Which icon set should they use? Traditionally, developers had to rely on just images formats to quench their needs. However, using images for icons delivers scathingly poor performance in terms of render quality and resolution. But now developers have 2 choices at their disposal – Icon Fonts vs SVG Icons(Scalable Vector Graphics). This is a debate that shows no signs of abating is splitting the dev community into two. Proponents of both icon formats argue the merits of one over another. However, in recent times there has been a general consensus and momentum towards SVG icons format. SVG icons system ensures better performance, higher accessibility standards, high rendering quality, unmatched flexibility, and extensive customization. In this article, we will explore in brief the history of web icons, pros, and cons of font icons vs SVG icons. Early 2000s started a new trend of image sprites. An image sprite is merely a collection of separate individual images put together to form a single image. Image sprite arranges all icons in a single GIF or PNG file and is loaded as a CSS background image. By adjusting the CSS background property, only the required icon is displayed. Sprites proved to be revolutionary for web fonts by solving the malice of generating multiple HTTP server requests triggered by individual images. This resulted in the conservation of bandwidth and increased website load speed. Moreover, a lot of accessibility issues are also solved as background images are invisible to text browsers and screen readers unlike images which are regarded as content. Here we have a image sprite – “last-guardian-sprites_0.png” containing a number of character icons. Instead of using 24 separate images, we use this single sprite image to reduce number of server requests and bandwidth. Using CSS, we can play with background position property to display only the icons we want hiding the rest from view. Note that img_trans.gif is a just small transparent image being used because “src” attribute cannot be left empty. By setting background position to 0, 0 and the width, height of the container set at 75px each, we are able to display the first character icon. Altering the value of background position to -85px 0, we can display the second icon from the image sprite. 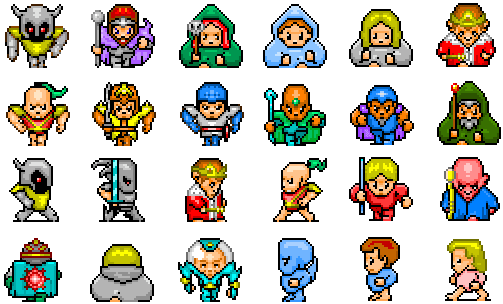 A useful free tool to generate image sprites that you can use is Toptal Sprite Generator. Go to font awesome official website. Either use CDN or download the library files on your system. Link the Font Awesome CSS stylesheet to your webpage. Visit the icon fonts library page and copy the class names of each icon you wish to use. If you want to create a custom icon font pack using icons from different libraries like above, then visit Icomoon app page. Import icon files from your system or picks the icons from icomoon library to build your own custom icon pack. This way, you only to add the icons which you need in your project instead of bloated library files containing several thousand icons. This will enhance your website’s performance by decreasing the file size and the number of server requests. Icon fonts are beyond doubt the widest solution for web icon. However, just like CSS image sprites, Icon fonts are losing their patrons to SVG. Although icon fonts are vectors making them scalable to any resolution, still they are not free from snags. Using icon fonts can lead to the generation of multiple server requests and can also lead to invisible text flashing during the period when font libraries are still loading. If the browser for some reason does not comprehend the icon font, a blank space is displayed. This is the reason why a lot of developers prefer the latter in icon fonts vs SVG icons. 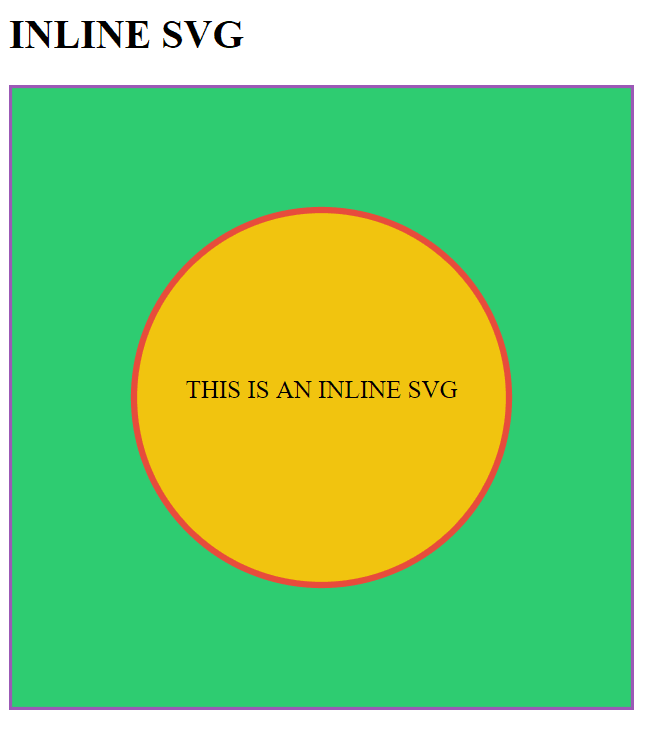 SVG as I stated in the introduction stands for “Scalable Vector Graphics”. The primary purpose of SVG icons is to define vector-based graphics in XML format. SVG icons are slowly earning the stature of a new standard for web fonts and images. Instead of a font or an image, SVG is instead a block of XML code directly served to a browser which renders it in an intended manner. More and more developers are leaving behind icon fonts and are adopting SVGs. Not only does offer SVG offer an unmatched ability to be scaled to any size without any shred of quality degradation but also better anti aliasing than Icon fonts. Moreover, you can edit, color, or animate each individual bit of an SVG icon, unlike your traditional icon font. Also since SVG icons are just a block of code, their sizes are much lower to that of image based PNG JPEG icons. Although in this regard of file size, icon fonts edges out even SVGs. I will be talking a detailed comparison between icon fonts vs SVG icons later in the blog. Now, that we are done with the flashback. I will compare Icon fonts vs SVG Icons. We will look at 8 key metrics to compare Icon fonts vs SVG Icons. When it comes to file sizes icon fonts have a slight edge over SVGs. Your file size can be considerably larger if you are using Inline SVG over external SVG icon file. One major reason for this is the fact that unlike external SVG, Inline SVG is not cached by the browser. One way of reducing the file size is SVG sprites. However, SVG sprites can only be colored using filters or masks which suffer from a poor browser support. For multicolored icon, using Inline-svg is necessary. Verdict on Icon Fonts vs SVG Icons – File Size : As far as file size is concerned Icon font has a slight advantage over SVG. However the difference in file sizes is not that prominent and can be ignored. One major advantage of SVG icons over Icon fonts is their superior accessibility. SVGs are armed with built in semantic elements – like < title > and < desc > that makes it accessible to screen reader and text browsers. Unlike icon fonts, SVGs are treated as an image and not as a text. Moreover SVG is compatible with WAI-ARIA specifications – aria-labelledby attribute. Verdict on Icon Fonts vs SVG Icons – Accessibility: When it comes to accessibility, SVG is the clear winner. As we have discussed earlier, Icon fonts are standard fonts which can be easily cached and boost load speed. However, this merit is plagued with a major flipside – it would require addition HTTP Server request for caching. On the other its the opposite case with inline SVG. Inline SVG do not make any additional server requests, however it cannot be cached by the browser as it is considered block of HTML code. This can be solved by using External SVG file. Choosing which icon system is right for you depends squarely on your need – if you need a few icons without any multicolor modifications and animations then icon fonts are the right choice. However, if you are using a large number of icons which are multicolored and have animations then, SVG should be the right choice. Another concern with icon fonts is that they may encounter occasional failures. Loading errors leave black spaces which can have an adverse effect on page design. Verdict on Icon Fonts vs SVG Icons – Performance: SVGs have a slight edge as Icon fonts are susceptible to occasional failures. As we discussed before, icon fonts are considered as regular fonts by browsers. Therefore icon fonts are vulnerable to anti-aliasing techniques implemented by the browser which affects the visual quality of the icon making it blurry and less sharp. On the other hand, SVGs are treated as images by browsers, so no anti-aliasing rules are applied on SVGs. This ensures that SVGs are sharp and pixel perfect at all resolutions without suffering any noticeable degradation. Verdict on Icon Fonts vs SVG Icons – Scalability : In terms of scalability, SVGs have a big advantage over Icon fonts. While Icon fonts allow a decent degree of customization using standard CSS styling rules as compared to Image icons, still icon fonts are limited as far as flexibility is concerned. CSS styling modifications are limited to monochromatic color, size, standard transforms, and animations. SVGs not only enjoy the same CSS controls as icon fonts but also additional CSS stroke properties and filters. Each individual stroke in SVG icon can be animated independently. For example, in a clock-icon animation, mail opening/closing animation, notification bell animation. SVGs allow to modify individual parts of the vector to create multichromatic icons and images and even add animates to each individual stroke separately. Verdict on Icon Fonts vs SVG Icons – Animation : SVGs over a much higher degree of versatility as compared to Icon Fonts in terms of modifications and styling control. As icon fonts are inserted using pseudo-elements, their positioning is sometimes challenging. You might need to tweak different CSS properties like font-size, line-height, word-spacing, letter-spacing, vertical-align to align the icon font in the desired position. For SVGs positioning is much simpler. You only need to specify the size. Verdict on Icon Fonts vs SVG Icons – Positioning: It is much easier to position SVGs as compared to Icon Fonts. Icon fonts are generally considered quicker and less complex to deploy either using @font-face rules, cdn or CSS style sheets. On the other hand, there are multiple ways to use SVGs either as regular image, background images, objects or inline SVGs. Inline SVG is by far the most popular way to deploy SVG icon as it allows a high degree of modifications without triggering additional server requests to drain performance. Verdict on Icon Fonts vs SVG Icons – Deployment: No clear winner. Icon fonts are slightly easier to deploy but SVGs over a higher degree of modification and better performance. With regards to cross browser compatibility, Icon fonts enjoys a clear advantage over SVGs. Icon fonts enjoy complete support across all Desktop and mobile browsers and all browser versions including legacy IE6 to IE8. 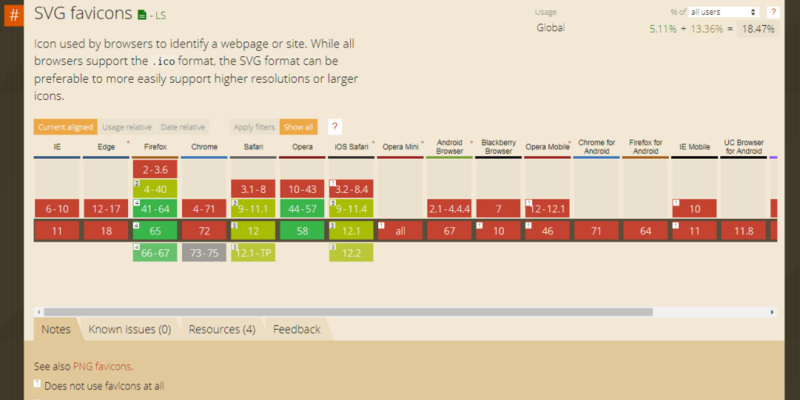 Although, SVG(basic support) offers cross browser compatibility across every browser except IE8 and below versions. Similar is also observed for some ancient browser versions of Android browser, Firefox & Safari. If you plan to make use of SVG effects for HTML then make sure to perform a thorough round of cross browser testing. → Similarly, SVG Favicons also calls for a cross browser compatibility testing. → Or, even if we talk about SVG SMIL animation. The browser compatibility issues are still faced over numerous browser versions. This is one minor drawback of using SVGs as compared to Icon fonts which enjoy excellent browser support across the board. There are also slight concerns that IE9-11 and Microsoft edge sometimes do not scale SVGs in a proper manner although this can be easily rectified by tweaking some CSS rules. That looks a bit scary and unfortunate for SVG lovers. Fortunately, we have automated cross browser testing tools such as LambdaTest who can help us quickly identify any anomaly is rendering of SVG on more than 2000 real browsers and browser versions through a Selenium Grid on cloud along with manual live-interactive testing of your web-app by loading it on your desired OS/browser configuration through a VM hosted by LambdaTest cloud servers. Verdict on Icon Fonts vs SVG Icons – Cross Browser Compatibility: Icon fonts enjoy much wider Cross browser Compatibility support as compared to SVGs. However, you can try to plug this gap by either using necessary fallbacks or Polyfills. How To Build Your SVG Icon System? Icon Fonts provide a convenient way to developers to add any icon to their page within seconds. All the icons are available in a single file either hosted locally or on a CDN and you can easily choose any icon to display using the corresponding class or code. One of the most popular Icon font library is Font Awesome, which we used in our example in the above section. We now want to have a similar functionality with SVG Icons where a single SVG sprite has all the icons bundled in it. To build such custom SVG icon system, you first need to either choose individual icon files or select from existing font icon library. These files can either be icon fonts or svg icons. If they are icon fonts, you would first need to convert them into SVG icons. 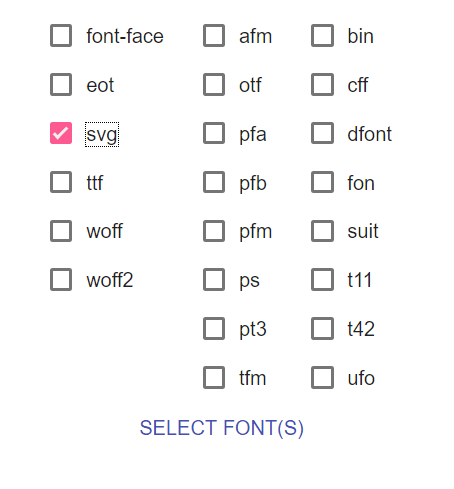 The best tool to convert Icon fonts of WOFF/TTF/OTF format into SVG icons would be Online Font Converter tool. Visit the site and select output font type as SVG. Now extract the zip file and place the SVG icon (svg extension) file in your fonts folder. Convert all your Icon Fonts into SVG cons. The best tools that i would recommend is Fontastic and IcoMoon. One advantage that Fontastic offers over IcoMoon is permanent hosted CDN link for our SVG sprite, that too available for free account. IcoMoon on the other hand offers temporary 24 hours CDN hosting only, permanent reserved for premium account users. But IcoMoon offers a much larger Font Library selections of its own and other popular 3rd party libraries as well. In this Blog i would be explaining building your Svg icon system using IcoMoon. Instead of uploading custom fonts, you can also use an existing library like font awesome and linea to select the svg icon that you require in your project. This will help to reduce file size as you won’t need to add the entire library to your project, Simple go to IcoMoon App homepage and select add icon from library. Once you have extracted the Zip, the files that we would need are symbol-defs.svg and svgxuse.js. Using your SVG Icon System with Inline SVG. <svg aria-hidden="true" style="position: absolute; width: 0; height: 0; overflow: hidden;" version="1.1" xmlns="http://www.w3.org/2000/svg"
Using your SVG Icon System with an External SVG. [class^="icon-"]and [class*=" icon-"]to apply styling. It is necessary to specify width and height for the svg icon so that it isn’t very large and out of proportion with respect to surrounding text and other elements. This is why we set the width and height to 1em, which makes the font size equal to nearby text. You can give it any custom value of your choice. That Was My Opinion. Tell Me Yours?! This debate of Icon fonts vs SVG icons has been raging for quite some time now and both sides have their share of proponents advocating merits of their respective Icon Systems. However, there has been a major shift in developer community towards adopting SVG icons in recent times and shows no signs of abating. As far as browser support is concerned, SVG is right up alongside Icon fonts for IE9+ and Android 2.3+, thus covering 99%+ user base while offering far greater accessibility, scalability, and control. Oh, and don’t forget to mention your favourite out of the two debated, Icon fonts vs SVG icons?